Transfer spending in the Premier League has reached £500m this summer, £335m short of last summer's total with four weeks until the transfer deadline. 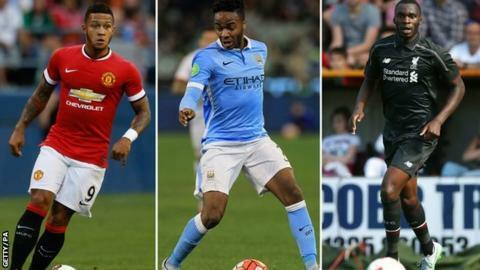 Raheem Sterling's move to Manchester City for an initial fee of £44m has been the highest so far. Manchester United boss Louis van Gaal has hinted at a "surprise" signing despite spending £83m already. "A new record is likely as clubs look to benefit from the new TV deal," said football finance expert Rob Wilson. The transfer window shuts at 18:00 BST on Tuesday, 1 September. Starting from 2016-17 the Premier League TV rights deal increases from £3.018bn to £5.136bn for three seasons. The bottom club will pocket £99m per season with the champions earning more than £150m in prize money, even before extra money is paid for featuring in a TV match. Financial analysts Deloitte said the £500m milestone had been reached last Friday. In addition to Van Gaal's "surprise", Premier League champions Chelsea are reportedly interested in Everton's John Stones with a £26m bid turned down, while Manchester City have been linked with Wolfsburg's Kevin De Bruyne - all deals which could substantially increase the current figure. Former Liverpool defender Mark Lawrenson told BBC Radio 5 live: "I think Manchester United are going to go massive on someone again, they need a centre-forward." The 2014-15 season saw £965m spent across the summer and January transfer windows - but Sheffield Hallam University lecturer Wilson believes there is potential for a record spend across the season. He also thinks that the new BT Champions League deal worth £897m starting this season has been a factor behind the summer spending. "What's driven clubs to spend, is not necessarily just Premier League money, but BT entering the Champions League market," added Wilson. Reports put earnings at £9m for clubs reaching the group stages, with the winners receiving £70m. Wilson says that although a new record looks set to be broken this summer, he thinks that clubs' net spend might be down as they seek to stay within Financial Fair Play (FFP) rules. "Manchester United have spent £83m this summer, which is fairly reasonable after spending £59.7m on Angel Di Maria last season," said Wilson. "If they recoup about £45m for selling Di Maria to Paris St-Germain, they could sign Pedro from Barcelona and their net transfer spend would still be pretty modest." Liverpool have spent £32.5m on Christian Benteke, but waited until they received funds from Sterling's record-breaking sale. "We are seeing clubs being sensible, partially because of FFP," Wilson added. "Fiscal responsibility is becoming routine, and although clubs were resistant before, now they are seeing the benefit of being more frugal.